When you think of a spring garden, do your thoughts meander across rows of lettuce and carrots, past spinach and scallions, and radishes? As you contemplate the best things to grow, wind around to thinking of peas, the hallmark of March planting. Several types of peas are perfect for growing at home. Garden, or English, peas are best for gardeners who have a lot of time on their hands and want to spend an afternoon shelling the seeds from the pods for their meal. Several years ago I shelled what I thought was a huge bowl of the pods; at the end of an hour I had roughly three tablespoons of peas. 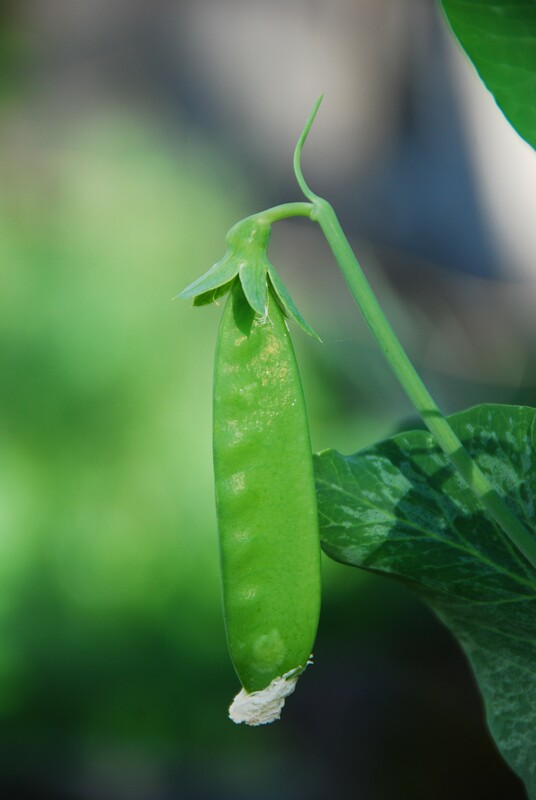 Cooks wanting more performance from their plants should consider planting snap or snow peas, which can be eaten pod and all. 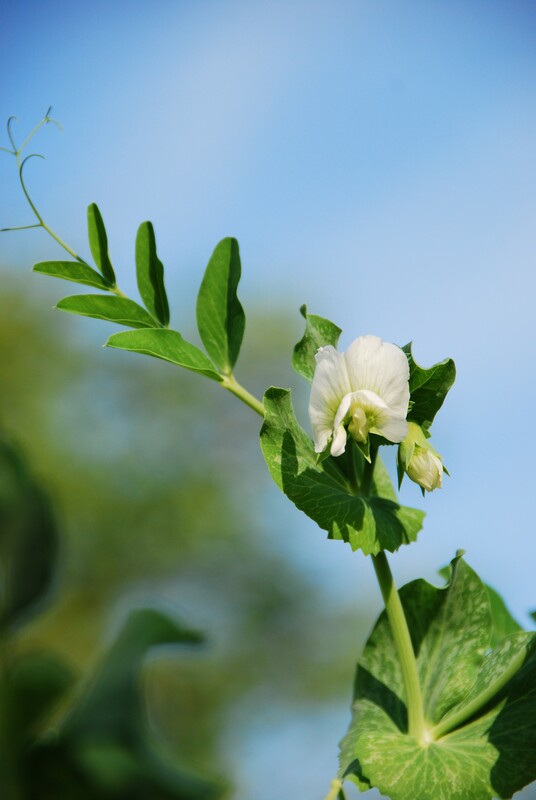 Snow peas are harvested young, before the seeds swell, while snap peas are delicious once the peas fill the pod. Superb in stir fry and salads, these peas are kitchen-ready for quick meals. There’s a variety I’d never seen before offered by Seed Savers Exchange in Decorah, Iowa, a big, six-foot vine loaded with crisp sweet pods. But it isn’t the towering vine or the prolific crop it gives that caught my eye; the beauty of this plant is that the peas are yellow (Golden Sweet Pea). Peas come in green and blue, but as a gardener with a sense of humor, yellow peas were irresistible. The two-tone lavender blossoms are a bonus that makes the whole plant pretty. Toss these beautiful blossoms, or the white ones, in a salad and your guests will be impressed. Peas are a cool-season crop, so if your soil is 40-degrees or warmer you can sow them directly into your garden. But they prefer to germinate at warm temperatures, then grow cool; savvy gardeners sprout their peas indoors, then pop them into the ground. To give yours a head start, place them between damp paper towels in a warm place, checking them several times per day to make sure the towels are damp and to look for germination. Once they’ve sprouted, plant them one-inch deep and two-inches apart. Although many varieties a short enough to need no staking, my pea will need a bit of trellising to keep those glorious, golden pods aloft. My usual three-foot tall chicken wire support won’t do. A full-scale structure is needed, and amongst my anxiety over choosing between nylon netting, cement reinforcing mesh, or chain-link fence, my spouse offered a brilliant plan: a chicken wire coated pvc tunnel that opens to one side. Planting sun-sensitive spinach and lettuce under the pea tunnel will let me extend their season, protecting them from heat as the pea vines grow. Because they’re snow peas, they climb readily, and need little encouragement from the gardener to find the trellis. Once my trellis and bed is ready, all a gardener need do is wait for St. Patrick’s day to be planting o’ the green – peas, that is.